We went for a walk in the forest in Thickwood on Saturday, at the bottom end of Silin Forest Road. It was a lovely change of pace from our regular walks in the downtown area. Heather had read about a particular hike that sounded intriguing. 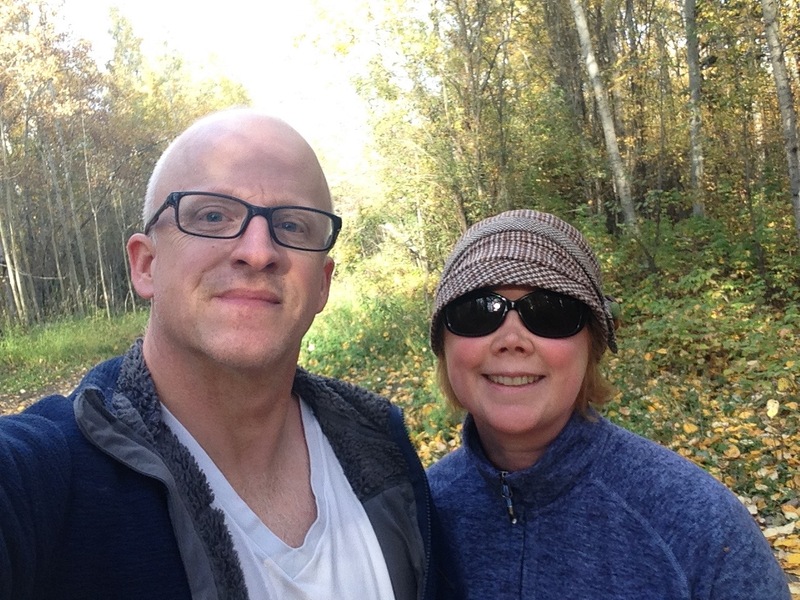 You'd think after so many years of living in Fort McMurray that we would have had occasion to explore all the walking trails. Apparently not. We returned on Sunday, but drove down Thicket Drive to Ross Henniger Memorial Park. 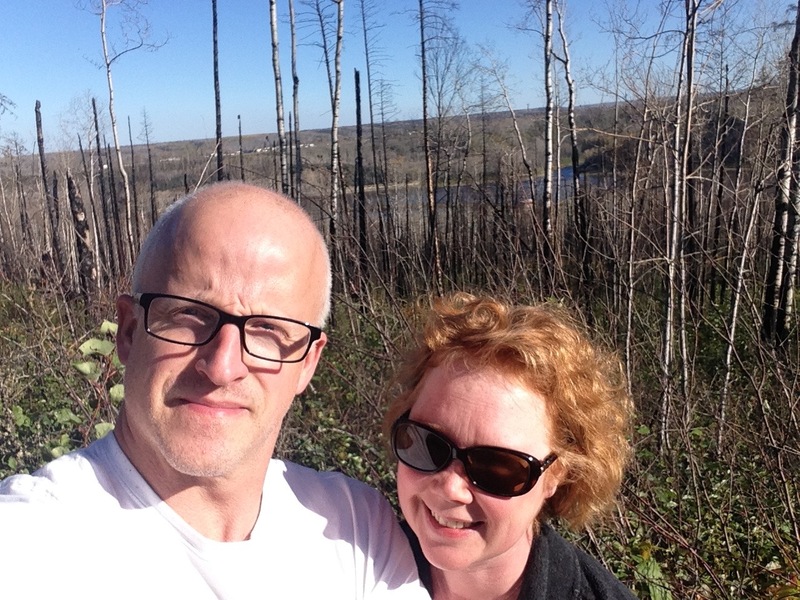 "Let's see if there is a trail head there," said Heather, still looking for an expansive view of the Fort McMurray Golf Club and the Athabasca River Valley. 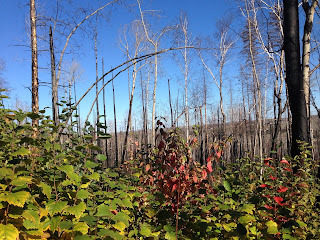 As we began walking down the asphalt path, we saw our first glimpses of the burned out forest - this is the fire that threatened the Water Treatment Plant and made its was up the hill toward Thickwood. 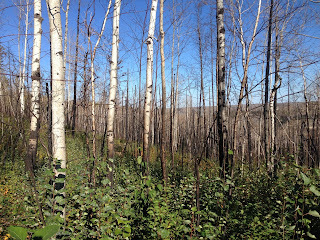 On the left side of the path, as we walked south, and a few trees in, were countless remnants of trees, black as soot near the ground and stripped of their life force all the way up. To our right, a perfectly untouched swath of trees beyond which lay a row of beautiful homes and yards along Thicket Drive. It was a sobering view and a sobering thought: imagining what it would have been like in this spot on May 3rd. "I just can't understand how they stopped it," I said. "It came so close." 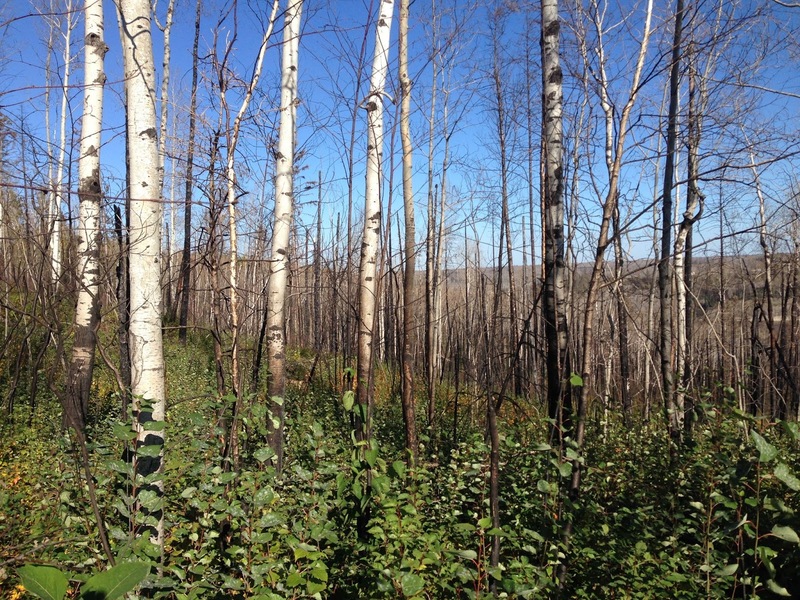 We went to the left, on to a well-worn dirt walking trail, into the burned out forest and toward the river valley off in the distance. The way nature bounced back left me speechless, the striking fall foliage juxtaposed against the backdrop of blackened tree trunks. Trying to imagine the inferno of five months ago, I was as shaken as I've been since returning to the community on June 1st. 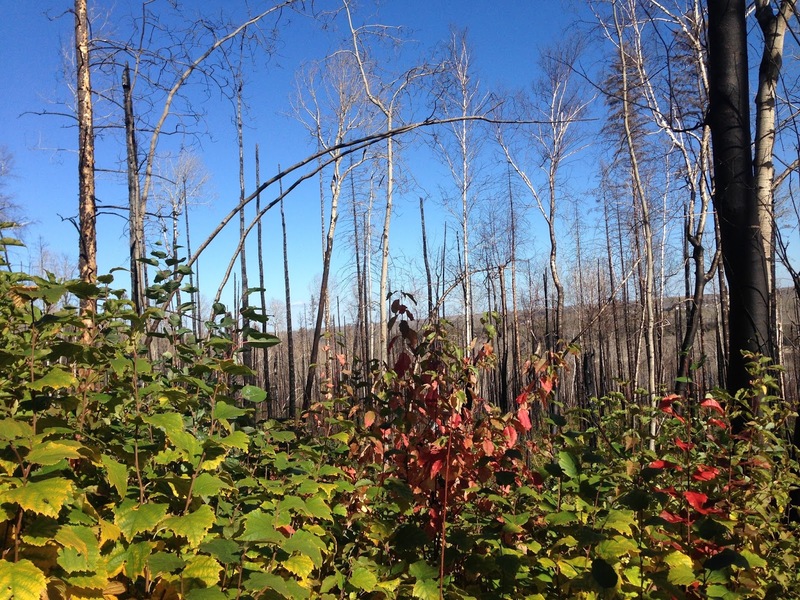 "Even parts of the forest floor are scorched," observed Heather. We walked on, getting a better and better view of the mighty Athabasca and its striking valley with each step. We discovered a little piece of heaven on yesterday's walk, and a visceral reminder of how close "The Beast" came to gobbling up even more homes than it did. It is a miracle that Thickwood survived; it came so close. You can see the burned out forest in pictures and television news reports, but nothing compares to actually being there, surrounded by resilience and towering reminders of what happened on that crazy day. This particular patch of forest offers an unparalleled view and a great venue for reflection. While we didn't see any bears, we certainly noticed several signs letting us know that we were in "Bear Smart" country. I felt their presence in some weird way. I had left to go on that walk knowing that I wanted to take a break from painting commissions yesterday evening and do something for me, but I didn't know what it was going to be. 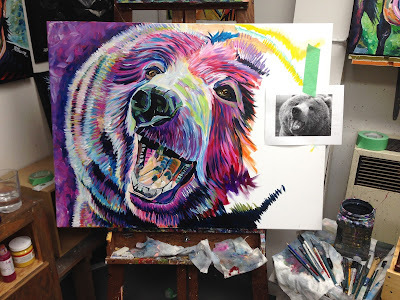 After that beautiful walk, I thumbed through my inspiration file and came across a photo of a bear. It was instantly clear that he needed to be the subject on this glorious day. He's not quite finished, but the magic and impact of that sobering walk in the forest, seems to have found its way into the painting.